Local Search Marketing is becoming more and more important. As a small business you’re probably saying “yes, it’s always been important”. But I’m talking about marketing tactics and specifically knowing how to approach it. It’s driving people crazy with all the changes lately. Marketing a local buisness in a region online is completely different than attacking a national or international market and you’ll find that more and more of my emails going forward will be focused on local search marketing. The future is truly local and Google agrees. Why should you be concerned about specific local tactics? Recently Google made a huge change in how they handle search results. They essentially made a massive shift in their algorithm that favors local businesses. In the past, if you searched for something generic like “law firm” or “dentist” without a geo-modifier term (like Cleveland, Ohio) Google would return mostly general information or national results. Notice below how almost everything shown (including paid ads) are completely targeted to where I’m searching from in North Canton, Ohio. So get me listed Chris! What are you waiting for? 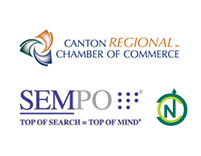 This change can open up a can of worms for businesses because not all businesses serving North Canton are actually located within North Canton. (Yes, you can see where I’m going with this) This makes my life hell as someone in charge of solving this problem for my clients. So on one side it’s good for small business, but at the same time there are many other variables that cause one business to show up for a local search and one to fall off the radar. Type 1: A business that wants to service clients in the greater metro area but is actually situated in the center of a city. Problem: Depending on competition, Google may not see this business as a resource because they are situated downtown and may not seem relevant to the suburbs. Type 2: A business like a caterer, plumber, etc that perhaps does service the entire region in and around the city, but themselves are actually situated outside the city center. Problem: Because they are outside the city they won’t reach people searching from inside the city because of competition or their competition’s proximity to the city center. Type 3: The local business that is in the suburbs of a city (like a coffee shop), that wants to be found by people in the surrounding suburbs and no further. Problem: Depending on the competition in and around the city, they might not be listed because the city results radius overrides the suburbs. So Google might end up returning results for the closest city because there are so many more options available! I’m sure that I’ve gone way too far with this example, but the point is that it’s complicated and the only way to fight the battle is to do all the right things ongoing. What are some local ranking factors that you should consider? 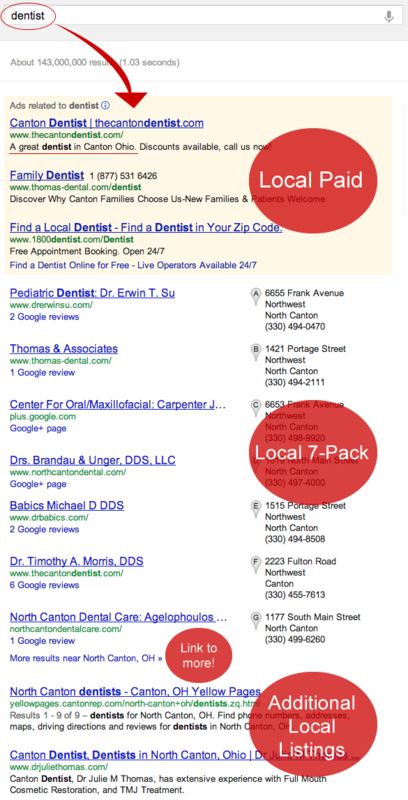 I’ve written about this extensively on my personal blog about local search marketing and if you really want to get your mind blown, visit David Mihm’s website to get the full list of local search ranking factors. But here are the top things that affect why you rank locally in 2012. I’m sure you can see how it can quickly become complex based on the competition and where you’re located. Your Address: Starting at the top, your physical address figures in big time. Unfortunately businesses with locations that are close to the city center often win out and it’s currently hard to fight. But Google is continually getting better at this. Google+: Many of these top factors are related to your Google Places/Google+ Local listing and how well it’s optimized. 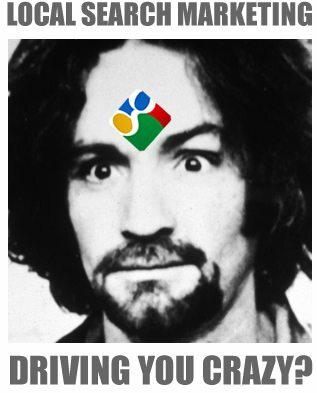 So if you roll your eyes about the new Google+ you should think again. Domain authority: There are many factors that figure into this. Everything from age of the domain name to how many external links point to your site. Keywords: Having an optimized website and listings around the internet that use the right keywords and categories is key. Offsite Reviews: If you don’t have any reviews on external sites like Google, Yelp or Yellow Pages make it a priority. Talk to us about a strategy to get this going because it’s important. Citations: Citations are consistent mentions of your business around the internet — and by consistent I mean that your name, address and phone number matches exactly. 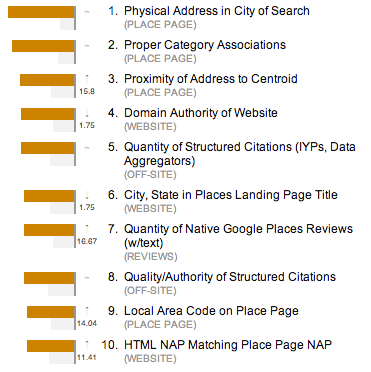 The volume of optimized citations from all the priority websites around the web is important too. Ask us to help if you’d like to improve on this front. Linking your website to other citations: Lastly, having your NAP on your website and making sure that it matches everything else on the internet is extremely important. If you have multiple locations you should have individual location pages with your address, phone and zip code clearly displayed. Link directly to your location on Google maps for good measure and to complete the circle. I could go on and on about this but the takeaway is that specific local tactics are important and many of them don’t involve your actual website. This is a fact that I’m continually trying to tell people that do not have an ongoing plan to market their website. It’s complicated and it really can drive you crazy if you’re trying to keep up and do it right. That’s why we specialize. Stick with me on this and I’ll try to share what I know and help ongoing. If you’re a current client be sure that we’re on this for you already.